Obtain CCW and a MMJ card in Nevada? Can I Have a CCW and a MMJ card in Nevada? One of the most common questions I get from clients is whether they can obtain a concealed handgun license (in Nevada, this is called a CCW) while simultaneously possessing a medical marijuana (MMJcard in the state of Nevada. Before August 2016, the answer to this question would have simply been, “yes.” This is such because the Oregon Supreme Court decided in Willis v. Winters that the Sheriff owed a duty under Oregon law to issue CCWs – even to those individuals otherwise qualified to have a CCW but who hold a medical marijuana card. The Oregon Court further held that the Sherriff’s duty was not preempted by 18 U.S.C.S. § 922(g)(3), otherwise known as the Gun Control Act. The US Supreme Court decided not to hear the appeal of Willis v. Winters, thus, essentially ratifying the Oregon Supreme Court’s decision. Despite this US Supreme Court decision relating specifically to Oregon, its application was not limited solely to that state. As such, until August 2016, that decision provided a legal position on CCWs and MMJ cards other states were free to use – including Nevada. What is the Gun Control Act and why did it matter? The (Federal) Gun Control Act states that a person who uses marijuana, even for medical purposes, is prohibited from purchasing or possessing firearms. However, the Oregon Medical Marijuana Act allows for medical marijuana card holders to possess a CCW because those medical cardholders are deemed law abiding citizens under Oregon state law. So, what happened in August 2016 to change things? The United States Court of Appeals for the Ninth Circuit decided in Wilson v. Lynch that a firearm or ammunition could not be sold to MMJ card holders in Nevada. This clarification left no doubt about how far The Gun Control Act reached. Practically, this decision also clarified that Nevada cannot issue CCWs to MMJ card holders – regardless of whether the cardholder actually uses marijuana. Wilson v. Lynch changed the MMJ/CCW legal landscape in Nevada from one of tolerance to that of prohibition. What Happened in the Wilson v Lynch case? Wilson, like the plaintiff in the Oregon case, was a MMJ card holder. A licensed firearm dealer in Moundhouse denied Wilson the right to purchase a firearm. Wilson responded by suing the government for constitutional violations and claimed, among other things, the infringement of her 1st, 2nd and 5th amendment rights. When Wilson went to purchase a firearm, the firearms dealer told her to complete “Form 4473” which required her to indicate that she was an unlawful user of a controlled substance because she held a current MMJ card. Marking that option (which Wilson left blank) would have been a per se prohibition on Wilson’s ability to purchase the firearm. Despite leaving that option blank, the firearms dealer had prior knowledge of Wilson’s medical marijuana card and denied her firearms purchase anyway. The firearms dealer denied Wilson because of a 2011 Open Letter from the Bureau of Alcohol Tobacco Firearms and Explosives (ATF). This letter clarified ATF’s interpretation of the Gun Control Act and how the Act affected MMJ cardholders. Specifically, state authorized MMJ cardholders were unlawful users of a controlled substance under Federal law, and therefore are prohibited from purchasing or possessing firearms or ammunition. Wilson argued that the 2011 Open Letter from the Bureau of Alcohol, Tobacco, Firearms and Explosives (ATF) was unconstitutional under several different legal theories. What are the Implications of the Wilson v Lynch case in Nevada? Nevada passed a constitutional amendment in 2000 legalizing marijuana use for medicinal purposes. This constitutional amendment expressly stated that a valid MMJ card holder would be exempted from most marijuana related crimes if the MMJ holder was using MMJ in accordance with Nevada state law. However, the Ninth Circuit held that Federal law, in this case the Gun Control Act, preempted Nevada state law and Nevada’s Constitution because the ATF’s Open Letter clarified that, under Federal law, MMJ is a controlled substance with no medical use, and therefore MMJ cardholders were unlawful users of a controlled substance and therefore prohibited from purchasing or possessing firearms or ammunition. This Ninth Circuit decision about the Open Letter essentially overrules the 2008 Oregon case in Nevada. This is such, because now a valid MMJ card holder is prohibited from holding a CCW in addition to being prohibited from purchasing or possessing firearms or ammunition in Nevada. • A CCW will not be issued to a MMJ card holder. • A firearm or ammunition will not be sold to a person if the dealer knows or reasonably believes that person has a MMJ card. • An MMJ card holder will be denied a CCW or the sale of a firearm and ammunition even if the MMJ card is not used and is only obtained for expressive or political purposes. • Once a person has a MMJ card, they are considered an unlawful user of a controlled substance under Federal law. • No physician can legally prescribe marijuana to a patient so that patient can be considered a lawful user of a controlled substance because marijuana is a Schedule I drug under Federal law (a Schedule I drug has no accepted medical use). • A person can purchase a firearm before acquiring or after surrendering a MMJ card BUT possessing the firearm (or ammunition) while holding a valid MMJ card would likely pose a legal problem if you are caught (under Federal law). Can I get a MMJ card if I already have a CCW in Nevada? Yes. People sometimes reverse the issue and think that if they possess a CCW then they cannot obtain a MMJ card. However, the prohibition does not work in reverse. Meaning, if someone already possesses a CCW in Nevada, then they may still obtain a MMJ card. The state may not deny you the right to a MMJ card because you own a firearm. This is simply not a concern of the Nevada Department of Health who is in charge of issuing MMJ cards. The issue is that possessing a MMJ card will prohibit you from obtaining a CCW but not the other way around. But getting issued a MMJ card does not make your possession of a firearm legal. However, if you already possess a firearm and/or a CCW and are caught with a firearm or ammunition as a MMJ card holder you will likely face serious legal problems if caught by Federal law enforcement. To recap, under federal law, if you use marijuana, you are prohibited from possessing a firearm- period. Thus, for the time being, you are at risk of arrest and prosecution if you have a run-in with a federal officer or agent. And, we have seen many instances of law enforcement improperly accessing the patient database to investigate whether a person is a MMJ patient. However, under Nevada state law, if you are a registered MMJ patient, you are NOT an unlawful user of marijuana and should not be arrested for possessing a firearm. (Anyone under the influence of marijuana is prohibited from possessing a firearm in both jurisdictions.) We have, unfortunately, had to represent people wrongfully prosecuted under state law by county prosecutors who did not understand the difference. Those cases were resolved favorably for our clients, but no one can prevent a state or local cop /prosecutor from making this mistake. While I’m sure this answer is not as definitive or assuring as one would like, until marijuana is rescheduled or excluded from the controlled substances list, we will continue to have situation where people must decide between their State of Nevada Constitutional right to use medical marijuana and their Second Amendment rights. If you or someone who know has been charged with having a firearm or ammunition as a MMJ card holder, then speak to a criminal defense attorney today to ascertain how they can help in obtaining the best outcome possible. 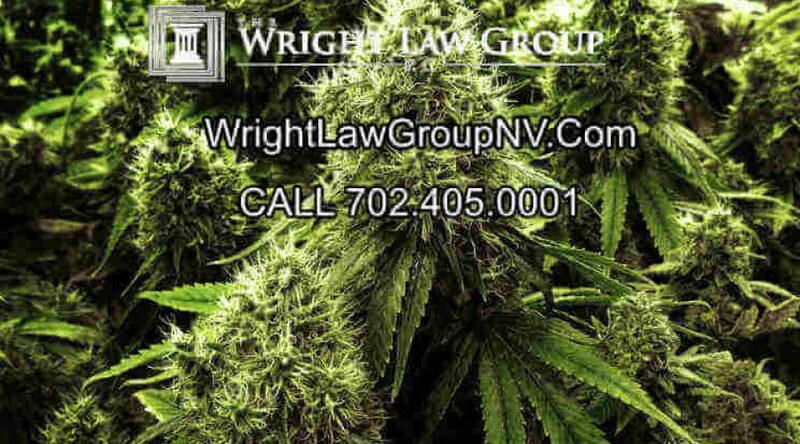 But don’t let just any law firm handle your case – The Wright Law Group, P.C., is a highly experienced and respected law firm specifically dedicated to defending persons charged with marijuana offenses in Las Vegas and throughout Clark County, such as possession, trafficking, manufacture and sale of all cannabis derived substances. Presently in his 25th year of practice, founder John Henry Wright, Esq., is peer rated A/V by Martindale & Hubble as “Preeminent” in the fields of Criminal Law and Litigation, but it is also our unique perspective and experience that sets us apart. the Wright Law Group, PC is up to date to on all the current laws, statutes and regulations involving medical and recreational marijuana in Nevada. We have extensive experience in both Criminal and Civil litigation. Call use immediately at (702) 405-0001. We are available 24/7.